The Visual Science Lab / Kirk Tuck: In case you hadn't heard Adobe created an economical cloud package for photographers. In case you hadn't heard Adobe created an economical cloud package for photographers. A month ago there was lots of agitation and uncertainty over Adobe's decision to move all future revs of PhotoShop to the cloud. More recently Adobe has been offering photographers who already have licensed copies of previous versions of PhotoShop a special pricing strategy. They are bundling PhotoShop, Lightroom and Bridge for a monthly subscription cost of $9.99. With tax it come out to a little less than $11 a month for me. I looked at the numbers for previous upgrades and the fact that the new upgrade path will be more of less seamless for me and decided to accept their offer. The contract holds the price to $9.99 per month for the next year. I did the downloads yesterday afternoon and they went without a hitch on a Mac using system 10.8.4. The upgrade is good for me as I keep getting cameras to test for which the raw files exist only on the newest versions of the software. The software is resident on your hard drive and the files are resident on your hard drive but can also be sync'd with the free, accompanying 20 gigabytes of space you get in the Adobe cloud. You also get a free website program to use with your images. See their site for more details. If you don't like the idea then just keep using what you have. I think the price is more or less unbeatable if you have Photoshop CS3 or newer, but I simply cannot get over the lack of an exit strategy - if money becomes tight, you simply cannot afford NOT to pay your monthly fee or you will basically be dead in the water. I'm aware that other applications can open PSD-files and to some extent can show the layering in the original file, but the moment you start using plugins you will be on extremely thin ice - I don't think you can expect an advanced Photoshop plugin to work outside of the real thing (generally, not even Photoshop Elements can run these plugins). I don't know if you use plugins for your post-processing, but I would like your thoughts on the lack of an exit strategy in case you either decide to switch to another application for post-processing (but you will still need to pay the subscription in order to work with the PSD-files you have) or if the monthly fee gets to a level where you no longer deem the software to be of a proportional value to you. Did this cause any concern before you decided to take the jump? Exit Strategy or Alternatives: What can you do that can be considered serious? 2) For some work depending on your needs (output ist JPG only, which means 8bit...) Photoshop Elements will be sufficient... And will run lots of the more common plugins. Thanks for the tip - What's the subscription rate after the first year? Kirk, the Photoshop Photography subscription to the Creative Cloud is $9.99 a month, and that price doesn't go up after the first year (like their original 1 Program subscription did). I signed up myself, and am very happy to get this deal. Don't use Adobe products any more. Not enough time to sort through the pictures I accumulate over a month or so and sweat over the good ones from the really good ones. Editing is a drag for me. Use to do that sort of stuff with RAW images from DSLR. Gave it all up. Got the Sony RX100. What a camera...gives excellent Jpeg files right out of camera. Save 'em all to usb thumb drive or sd cards. Upload most interesting ones to Google+ with "auto enhance" which work brilliantly. Snapseed now integrated, too, if I feel like tinkering with cloud edits. Make prints at Costco. 20mp mean plenty of room for big crops if need be. A very good deal after a rocky start with photographers. At $0.33 per day I am not worried about an exit strategy. If Adobe some day loses its mind and takes the price way up a smart geek will write a program to convert psd and/or dng files to something else. Converting straight PSD is not an issue - that can already be done with several applications, both commercial and open source. Converting PSD files created with plugins - that is a very different story. Maybe living outside the US where Adobes pricing has a long and not very flattering history (yes, we charge you twice the amount because we can - deal with it) has made me wary of Adobe and made me more or less expect them to exploit their position the moment they feel that they have a sufficiently large number of subscribers with limited alternative options, but so be it. I don't trust them at all, hence my wish for an exit strategy. If that were in place, I would be signing up in a heartbeat. Do the terms just say 1 year? I thought the pricing was 'forever'? The terms say one year but emphasize that this in NOT promotional pricing but is an ongoing pricing structure. There may be incremental raises in price but again, they (Adobe) emphasize on their website that this is not promotional and they don't anticipate the cost jumping up. Take with grain of salt but I think this represents a very affordable base. Thanks. There is no question it is a good price. Personally it will save me money over CS and LR upgrades, and if you stay 'current' with cameras you need to upgrade from time to time, or use the free dng convertor I guess. Most of the opposition seems to be this idea that you'll not be able to edit/open files you've created some hypothetical time in the future when you stop paying. But anytime I've switched software in the past, I convert what needs to be converted and move on. With Adobe, you have the option to get back in for a month for $50, even years later, so the lost opportunity of old files seems minor. $10/mo is pretty good for what you get :). Tough to expect a company to focus their strategy on people who never expect to purchase the software again! As a software guy I know how much it costs to constantly update software to keep up with new OS's, developer new features, etc... Easier to manage with a known revenue stream. 15% is pretty much standard to pay each year to keep up to date (though most still allow use if you stop paying). This is where the trick is. Once they have you at their mercy, they will rise the price - without mercy. We know them now. We know this is what they will do. Adobe, kma! 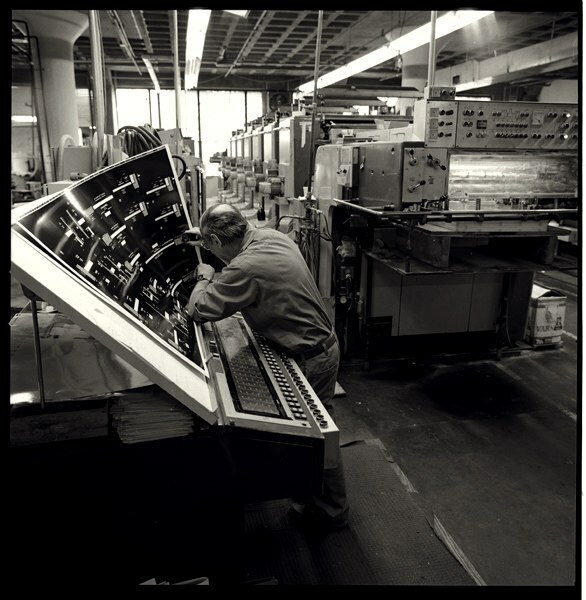 Very nice picture of an 8 color Heidelberg Speedmaster. We are printers in Costa Rica but don't have that kind of clients to afford a 40" press let alone with 8 colors! I hope that the new licensing scheme for PSD works, we are not in the cutting edge of technology and we still use CS3.